According to the Learning Styles theoretical framework, there are four types of learners. Each of these types of learners does best when instruction answers one of four simple questions: why, what, how, or where do we go from here? The first type of learner is the imaginative or innovative learner. This learner needs to find the answer to ‘why’ questions, especially “Why do I need to know this?” ‘Why’ learners aren’t even interested unless you can first convince them that something is important. A teacher must capture the participant’s attention and provide the motivation to explore. This student’s engagement is based on having a rational need or reason for the information. 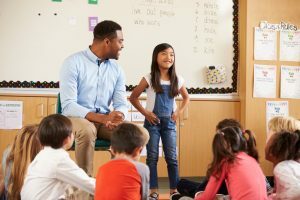 Great ‘why’ activities include group interactions, great stories, role-plays, object lessons, active learning games, short videos, and readiness activities to help connect the participant to the subject emotionally. The second type, the analytical learner, is most interested in the question ‘what’. What information is most important? This student learns best when they have as much information about a topic as possible. This participant is excited about facts, details, content, and information. Sometimes this learner focuses on surface knowledge more than deep understanding something. Although information is important, it does not present the entire picture. Learning and critical thinking occur with application, not just information. Great ‘what’ activities for the analytical learner are power point presentations, lectures, self-study, competitions, quiz games, content presentations, memorization, and written reports. The third type, the common sense learner, focuses on the ‘how’ question. How does it work? This student wants to know how to use the content. They are usually good with their hands and with translating information into action. They may be able to perform tasks without being able to explain fully how they did it or why. These students use their past experiences as a reference point for future learning. To engage this learner, make the connection between new content and its application. Great activities for the common sense learner include inquiry and problem based learning, projects, case studies, logical problems, concept maps, fixing, building, or other applications. The fourth type, the dynamic learner, asks the question, “Where do we go from here?” Dynamic learners are able to quickly and accurately adapt new knowledge to new situations. This student wants to take what they are learning and apply it beyond the current situation. This is the heart of critical thinking and information synthesis. The dynamic learner loves to brainstorm, think ‘outside the box’, discuss open ended questions, participate in group activities or competitive events, take on leadership roles in the learning process, apply what is being discussed in real time, or create new ways of using the information. The great news is that since all four of these types of learning are essential for fully mastering new material, varying our instruction to meet the needs of each type of learner will help all of our students learn the information more effectively. Es interesante como se hace esta clasificación de los aprendices. Veo que presentas ciertas estrategias y técnicas de aprendizaje que son favorables a cada uno de los 4 tipos de aprendices. Es importante tomar la parte que nos toca como docentes, a fin de ayudar a los alumnos a sacar provecho de sus capacidades. Gracias por compartir este artículo. Me gustó mucho.